Both are substantially higher (45% and 57%) than the Bitcoin price today of about $417. So to come up with a price target for GBTC, Needham first had to work up a Bitcoin price prediction. Rising demand for Bitcoin will produce gains of more than 350% over the next four years, Needham said. Specifically, the firm made a Bitcoin price prediction for 2020 of $1,896. In its report, Needham says it sees two primary use cases that will drive the price of Bitcoin over the next four years. "We see value in Bitcoin as a 'digital gold' and as a payment network that is enabling a global, open, permissionless financial system," the Needham report, authored by Spencer Bogart, says. The "digital gold" idea sees Bitcoin as offering a digital alternative to the role physical gold has played for thousands of years. That is, Bitcoin is a reliable store of value immune to the hazards of fiat currency and equity markets. Bogart points out that Bitcoin is designed to be deflationary – only 21 million bitcoins will ever be created – unlike fiat currencies, which inevitably lose value to inflation over time. "Over the past 20 years alone the United States dollar has lost 53% of its value, the British pound has lost 47%, the euro has lost 40%, and the Australian dollar has lost 64%," Bogart says. What's more, fiat currencies have a bad habit of imploding. "Over the past four decades Argentina has seen at least eight currency crises, four banking crises, and two sovereign defaults. Some Argentine people have seen their life savings nearly wiped out multiple times in a relatively short timeframe — lending further credibility to the search for a viable alternative," Bogart says. Needham estimate 75% of all existing bitcoins are dormant, being held as digital gold. Needham believes that demand for Bitcoin as digital gold will reach 25% of the size of the gold ETF market by 2020. Needham figures that will account for about 54% of the Bitcoin demand. Needham has calculated that the total retail global market for retail payments will reach $67.5 trillion in 2020, with $40.2 trillion coming from domestic payments in developed markets and $24.4 trillion from domestic payments in emerging markets. 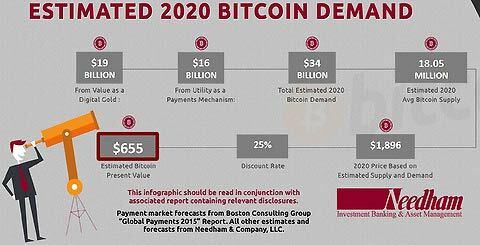 Needham estimates $189 billion of payments using Bitcoin will be made in 2020 – just 0.28% of the total market. "Even a very small slice of the global retail payments pie moving onto Bitcoin rails would be a significant positive catalyst for demand (and price)," Bogart says, adding that areas most likely to see the fastest adoption are for cross-border payments as well as in emerging markets. But the demand from both the digital gold and payments markets will require the total value of all bitcoins to equal $34 billion. Based on the total number of bitcoins then (about 18 million) and a discount rate of 25%, Needham ends up with the Bitcoin price prediction of $1,896. That's a compound annual growth rate (CAGR) of 46% — not too shabby. The corresponding price target for the Bitcoin Investment Trust, Needham says, is $62 a share, about 13% higher than the current price of about $55. The Wedbush target for GBTC is $60. But for investors following Bitcoin, the headline number is Needham's lofty Bitcoin price prediction. And even that may be overly conservative. You see, the same things that make Bitcoin useful as digital gold make it appealing to people in countries with failing economies and failing currencies. Case in point: Latin America, where the economies of Argentina, Brazil, Mexico, and Venezuela have been struggling. High inflation in the region has triggered a 1,747% surge in Bitcoin merchant transactions since the beginning of 2015, according to payment processor BitPay. Although it's hard to predict exactly when the tipping point will come – the point where the price of Bitcoin takes off – it will happen with the next few years. And it won't stop at $1,900, either. The Wedbush report gave estimates 10 years into the future. The Wedbush Bitcoin price prediction is $1,429, a bit lower than Needham's. But the Wedbush Bitcoin price prediction for 2025 is a whopping $17,473 – a gain of more than 4,000% from today's Bitcoin price. The Bottom Line: A new report from Needham on Bitcoin says the digital currency is undervalued today and will be worth far more just four years from now – 350% more. Needham sees demand coming from Bitcoin's use as both "digital gold" and as an alternative form of payment. 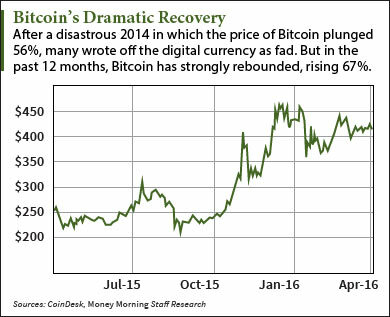 And given the conservative estimates Needham used, it's likely the Bitcoin price will end up far higher.